Strangely enough, although the migration crisis shook the country’s permissive consensus and accelerated changes in the German party system, the general mood is not one of fear. While the political class is aware that it may need to enact a rather fundamental reconsideration of Germany’s policy and its place in the world, Germans themselves do not seem alarmed, not even by the fact that many among them now put more trust in Vladimir Putin than in Donald Trump. They seem to long for a few more years of undisturbed prosperity, something which causes the country’s political leaders to refrain from initiating any major policy change. Merkel in 2018 is reminiscent of Gerhard Schröder after his re-election in 2002. Schröder saw that he needed to break with the traditional concept of social security if he wanted to preserve it. Merkel should see that she needs to conceive a new European and foreign policy for Germany. The political fate of her predecessor might discourage her from moving ahead. Merkel hinted at new times ahead in her Trudering beer tent speech in 2017, where she stated that Germany could no longer fully rely on the United States at all times. At the time, Trump had pulled out of the Paris Agreement and pushed the NATO 2 percent defence spending commitment up the agenda. Now, though, restating her warning after Trump imposed punitive tariffs on European exports and pulled out of the Iran deal is no longer enough. The German government should now address the EU’s need for unity; the chancellor herself has apparently realised that one of her other preferred phrases, of preventing Europe from falling apart, is less than what the situation currently demands. Events have forced Merkel the procrastinator out of her comfort zone. She needed to take the initiative and share her preferences on: reforming the eurozone; dealing with borders and migration; strengthening the EU’s institutions and processes; and enhancing Europe’s security. Interestingly, in her carefully staged recent interview the chancellor did not deal extensively with those of Macron’s ideas that pose the biggest issues for her government. On finance and on eurozone reform she remained close to her previous positions, but managed to throw in some new elements. For example, she confirmed Germany’s readiness to pursue a banking union and a single capital market and made clear that a European Monetary Fund would be created as an intergovernmental institution, contrary to the goal set in the coalition agreement. The EMF would also be allowed to issue shorter-term loans and carry out an independent assessment of “Schuldentragfähigkeit” (debt sustainability). Merkel backed structural reforms through a new budget as well as an investment budget. She committed herself to resolving these issues alongside an agreement on the next multiannual financial framework before the European Parliament election in 2019. On foreign and defence policy, her package was more unusual, though less specific. 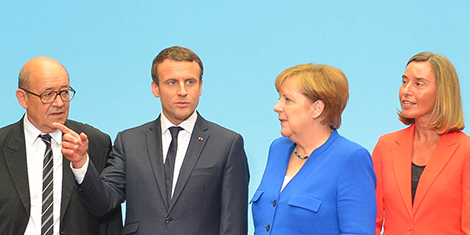 Merkel’s key concession to Macron was Germany’s support for the European Intervention Initiative. Mindful of the French idea to set up the initiative outside of EU structures, she still suggested connecting it closely to the PESCO (permanent structured cooperation) initiative, framing it as part of a future common strategic culture. While this was read in Paris with satisfaction, her other ideas may create more irritation. Merkel did not speak about majority voting in foreign and security policy, but suggested pooling the EU presence on the United Nations security council into a “European seat” next to the French permanent seat. Moreover, she picked up the idea of a European security council made up of a rotating group of member states (probably with some permanent seats as well). Such a scheme is clearly more power-centric than the current foreign affairs council and moves beyond the inclusive format of the European Council, so it will be divisive between large and small member states. On the other hand, it will commit even the largest members to a more community-focused position and policy, which may not be the preferred outcome in Paris. For Merkel, the newspaper interview format provided an opportunity to raise such ideas without overly committing herself and her government. On the most crucial challenge to her current government, the chancellor followed a similar approach. Moving away from her previous insistence on relocation quotas, Merkel painted a picture of much deeper integration in justice and home affairs, suggesting a harmonisation of asylum and immigration laws and regulations to allow for: the central administration of asylum claims by a European agency; common border management; border police and coast guard not subordinate to member state border security institutions; and a solidarity mechanism to which all member states contribute in “comparable” terms. Interestingly, she introduced her ambitious sketch with a reference to permanent structured cooperation in the area of defence, adding that she saw migration as a “truly existential question” for Europe – hinting at the option of a core group moving ahead should agreement among 27 member states be unattainable. The chancellor is still the same chancellor who does not like to govern by big ideas and grand designs. Although she evidently felt the need to share some medium-term prospects for the future, she nevertheless kept her cards close to her chest in order to control timing and impact. She could have chosen to present her ideas in a major speech in front of an international audience, such as at the recent Charlemagne Prize ceremony (see Almut Möller’s succinct analysis of the opportunity lost then). Or she could have chosen to present them to the German Bundestag: best during the budget debate, which traditionally serves as a general debate about the major strands of government policy. In light of this major interview now, both speeches she gave on those occasions concealed than revealed her thinking about the next steps. It is clear that Merkel wants to remain in full control of German foreign and Europe policy – and she wants to set the pace of change and content herself. With minimal involvement of her own faction or party ahead of this important interview, never mind any debate between the coalition parties, there is little sign of any loosening of the reins in terms of process, even if she has now taken some baby steps towards Macron’s more sweeping pitch laid out last year. The reactive approach has a number of other side-benefits, not the least of which is helping her keep any competitors in her party and coalition on a tight leash, using the pressure to respond to events and the lack of time to her advantage. In this, she may be closer to the German people than to her fellow political classmates, but she cannot be unaware of the need for change. She may be edging Germans towards a new future they are not yet ready to countenance; this may yet turn out to be too little, too slowly. Josef Janning is Head of the European Council on Foreign Relation’s Berlin Office as well as a Senior Policy Fellow at the organization. I just wish Germany what’s best for them. It’s up to the Union and the German People to make adjustments to ease policy conflicts.